On the football field, jersey numbers 10 and 7 are coveted like no other. Those numbers are reserved for talismanic players who typically direct the midfield or power the attack. In the past, Pele, Diego Maradona, Michel Platini, Gary Linekar, and Zinedine Zidane have worn 10. In the present, Lionel Messi wears 10 and Cristiano Ronaldo 7. Cut to the present English Premier League (EPL), the most valuable club-football league in the world, and the top six clubs there. Only four of the 12 jerseys stencilled with these two numbers are worn by players who are English: James Milner at Liverpool, Raheem Sterling at Manchester City, Marcus Rashford at Manchester United, and Harry Kane at Tottenham Hotspur. The remaining eight jerseys are worn by non-English players. In other words, 33% of those wearing these numbers are English players. This differential is screaming not just at an emblematic level, but also across the EPL, which is inherently non-English in nature (See map). 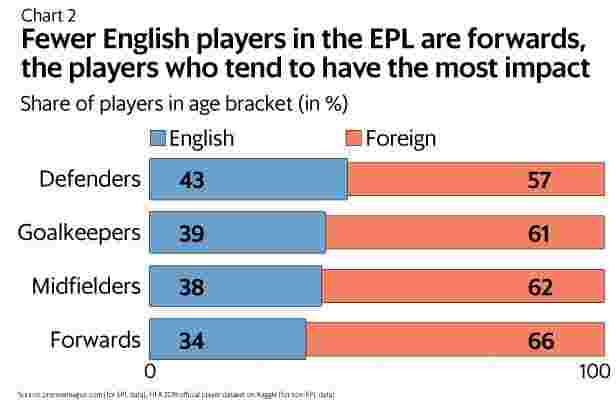 Of the 649 players who have been on the rolls of the 20 EPL teams this season, only 255, or 39% are English. The remaining 394 players, or 61%, are from 67 other nationalities, led by Spain (37 players or 6%) and France (31 players, 5%). As such, among top-tier European leagues, the EPL has the smallest representation of players who are classified as domestic players. It is followed by Italy’s Serie A (43%), Germany’s Bundesliga (49%), and Spain’s La Liga (64%). The divide is starker among the top six teams in the EPL. English players make up only 33% of the squads. In comparison, in the top three clubs of La Liga—Barcelona, Real Madrid, and Atletico Madrid—55% of the squad is Spanish. This minority representation of English players in the EPL underscores two larger issues of creative tension the league is grappling with. The first is homegrown talent: supply is struggling to keep pace with demand. The second is that of commercial pulls and pressures: the EPL is the world’s richest club-footballing league and clubs have to perform. So, in spirit, the representation of English players ends up getting diluted in three ways. The first is because of the current EPL rules, where the very definition of ‘nationality’ is tailored to suit footballing needs. The EPL follows the 4+4 homegrown player rule mandated by the Union of European Football Associations (Uefa), the body that governs European football. This rule states that for a club to have the maximum 25 players in its first-team squad, four players should have been trained in their junior years by the same club and four players must have been trained in their junior years by any other club from the same association. There are no restrictions on the remaining 17 players. If a club fails to comply, its first-team squad size will decrease in a certain ratio. In this rule, the nationality of the player doesn’t matter. For example, in the EPL, Paul Pogba (who is French) and Cesc Fabregas (Spanish) qualify as homegrown players as they came from the Manchester United and Arsenal academies, respectively. In the wake of Brexit, the body that governs English football is pressing EPL to reduce the number of unrestricted players from 17 to 13, but the league has opposed it. The second dilution is the level at which English players are coming in. 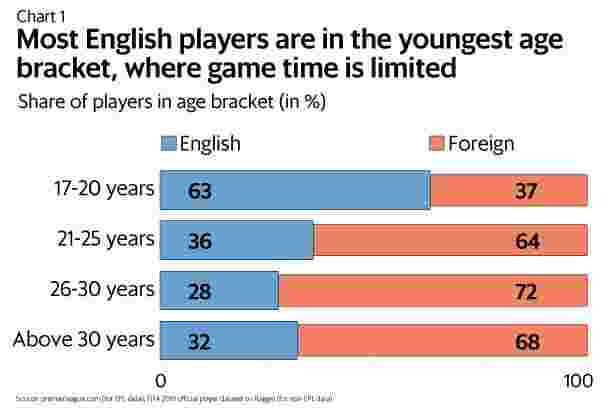 The leading age bracket is 17-20 years, accounting for 38% of English players. In this age bracket, the mix is tilted towards English players. In all subsequent age brackets—which is more representative of maturity in footballing prowess, and thus game time—it favours non-English players. In terms of position, English players are the least represented among forwards, who tend to make the most impact. For both these reasons, there’s a third dilution seen in the representation of English players: game time. This is most apparent among the top six clubs, who can shop anywhere in the world and have strong commercial reasons to do so. Tottenham Hotspur has been the best in giving games to English players. Of the total appearances made by Tottenham players this season, 33% went to English players. It is followed by Manchester United at 30%. 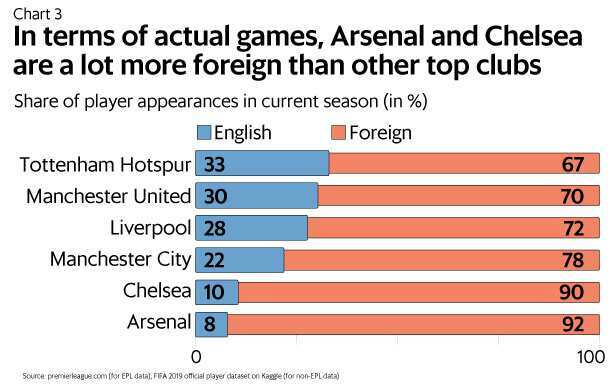 However, lower down, only 10% of appearances at Chelsea and 8% at Arsenal are English players. They are English clubs but with an international core and that’s sport in the 21st century.